This is the fourth book in the Bess Crawford series. I previously reviewed the first three books, A Duty to the Dead , An Impartial Witness, and A Bitter Truth. It is 1918, and now there are things on the battlefield more dangerous than German shells. The Spanish Flu is spreading across the lines on both sides, reaching even to those back on the home front. Bess is in the middle of tending to the myriad of sick and wounded when an orderly alerts her to the fact that there is an unaccounted for body in his storage room. Bess discovers a man who has clearly been murdered, a man she knows from her father’s old regiment. Unfortunately, before Bess can do anything about it, she faints from the influenza she had not yet realized she had. When she fiwhethenally comes to, she is in England, unsure whether any of this actually happened, or whether it was just a dream – at least until she learns that the man who alerted her to the presence of the extra body was found dead, presumably by suicide, almost immediately after she fell ill. Now Bess is convinced that what she remembers is real, and she hopes to bring peace to families of both dead men. 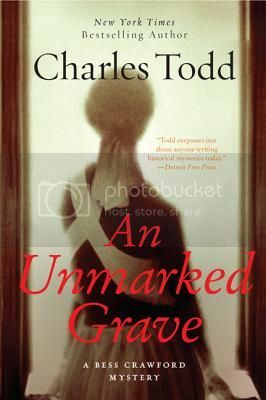 Like the rest of the books in the Bess Crawford series, An Unmarked Grave is compulsively readable and incredibly engaging. I found myself completely wrapped up in Bess’s story, worried about the danger in which she had put herself, and intrigued by her continuing relationship with Simon, and the attentions of a new man. There were a couple of aspects of An Unmarked Grave which failed to thrill me, however. The first was the incredibly brief reappearance of Bess’s Australian admirer from A Bitter Truth. In the midst of war – not to mention a murder investigation – I wouldn’t have been the least bit surprised if she had not come upon him at all, and the throwaway mention of him tracking her down in the midst of her illness only distracted from the story being told. My other issue was with the resolution. The ending was weak, and not particularly well supported by what happened in the rest of the book. These issues would cause me to downgrade the rating I gave An Unmarked Grave, if I were the sort who rated books. However, I would say that overall they didn’t not significantly decrease my enjoyment of the book, and are certainly not a reason to discount the merits of the series as a whole. I can still say honestly that I am sad to have finished the existing Bess Crawford books, and can only hope that Charles Todd will be continuing the series, and soon!